Random stuff - including Downright Weird » Got to show you this, so funny. My son caught his first fish. We tryed to tell him how to hold his fish, so we could see how big it was.. Your picture brings back memories from years ago. 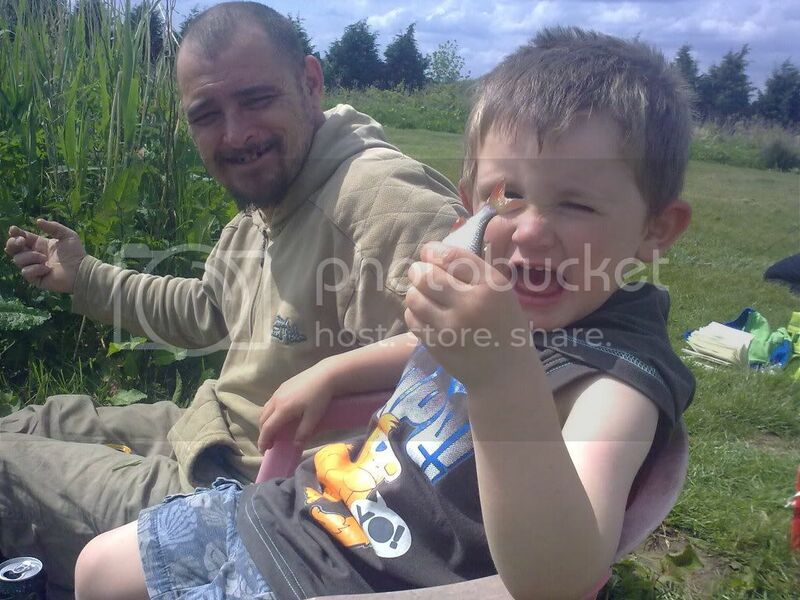 My son used to love fishing but couldn't bear to put the bait on the hook. As for taking the hook from the fish's mouth, that was an even bigger No-No. Yes hubby has to do that bit, even i cant do that. I just love the way he's showing his fish off. Looks like he's going to eat it. "Arrrhh - look at my fish mates!!" No, his intentions look anything but friendly! ah that is priceless sara, a great one to keep for his 21st birthday photoboard. Do you think if i send it off to a womans mag, or a fishing mag it would get printed? Not a fishing mag; they'd cut the sprog out of the pic! You could deffo send it off to a womens' mag. opps i think i read it wrong... Only having a laugh..
Im going to send it somewhere. Its on my wall at home..